This DVD Ripper for Mac is designed with many pre-defined output profiles. It highly supports most portable iOS and Android devices, such as iPhone XS/XS Max/XR/X/8/8 Plus/7/7 Plus, iPad Pro/Air 2/mini 4, iPod touch, Samsung Galaxy 7/6/5, LG G5, Sony, HTC, Moto, Xiaomi, HUAWEI, Microsoft Surface Book, Xbox 360, PS3, Wii and others. It allows you to easily view DVD movies on your smart phone or tablet. Whether the DVD is copy-protected or self-burned, you can use this DVD Ripper to rip the movie for your digital devices. The professional DVD Ripper for is equipped with many useful editing features to help you customize video effects before ripping the DVD. For instance, you can rotate video position, cut the video length to only save the necessary part, crop video to remove the black edge, add personal text and image watermark, adjust output video effects like brightness, contrast, saturation and hue. If you need all DVD titles like trailer, behind-the-scenes, you can merge various parts into one new video. Thanks to the latest hardware acceleration technology, AnyMP4 DVD Ripper gives you a super-fast DVD ripping speed. It can rip DVD to HD video format like MP4, MOV, MKV, AVI, WebM, TS and more. After ripping, you can enjoy the fantastic image and sound quality. In profile settings, you are allowed to set parameters, such as video codec, resolution, bitrate, frame rate, audio codec, audio channels, and so on. 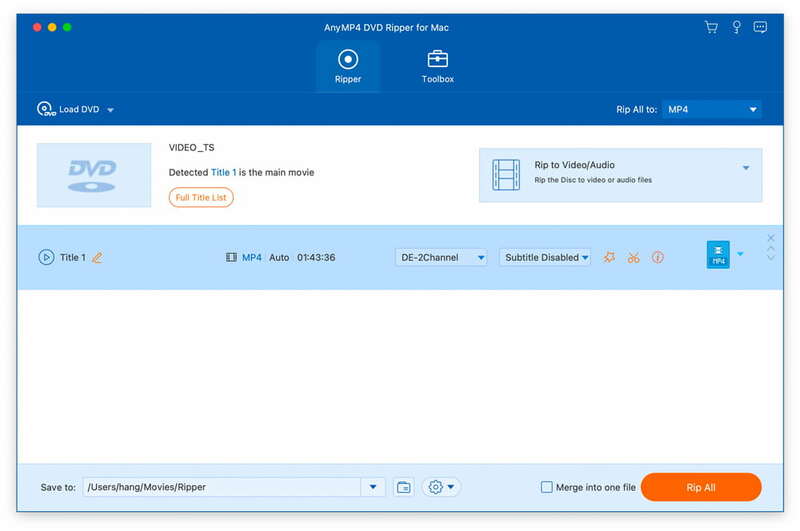 With a concise user interface, you can rip DVD to video in just few clicks. If the original DVD contains multiple audio tracks and subtitles, this DVD Ripper will show you all audio tracks and subtitles. Then you can select your preferred audio track and subtitle for the output video. The built-in player helps you preview the DVD before ripping. Then you can quickly check the desired titles of the DVD. Statement: First, please download the orginal installation package by clicking the download link. Of course you may also download it from the publisher's website. Using AnyMP4 DVD Ripper for Mac crack, key, patch, serial number, registration code, keygen is illegal. The download file hosted at publisher website. We do not provide any download link points to Rapidshare, Hotfile, Depositfiles, Mediafire, Filefactory, etc. or obtained from file sharing programs such as Limewire, Kazaa, Imesh, Ares, BearShare, BitTorrent, WinMX etc. Software piracy is theft. If you like AnyMP4 DVD Ripper for Mac please buy it.